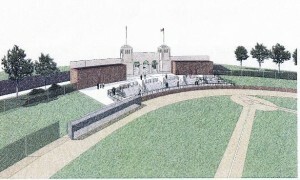 This is the latest architectural rendering of what the exterior of Greensboro’s long neglected War Memorial Stadium will look like if our City Council approves the expenditure of the $1.3M that was earmarked a couple of years ago, via 2/3rds bonds, for the ‘renovation’ of our National Registry of Historic Places property. But wait… there’s more. That’s not all we’ll get. The interior of one of the nation’s oldest sports facilities will undergo some slight, shall we say… alterations during its “renovation”. It will be lovingly transformed through the complete demolition of its 5500 seat capacity into the new and improved War Memorial Wall replete with seating for 500 fans who will enjoy a baseball game perched atop temporary aluminum bleachers. Oh, I can here the echoes of the anti-naysayers still. “No one’s talking about tearing it down”, they said. “War Memorial will become the state’s premier amateur sports facility”, they said. Well… here you go, Greensboro. These renderings were presented yesterday to the 325th meeting of the War Memorial Stadium Task Force that was appointed by then-mayor Keith Holiday to undertake planning for the facility. Over the years we developed many, many desirable options that would do the place proud for generations to come. But this one, known as “Scheme 6″, is where things are likely headed with the prevailing budget climate. The preservationists on the C ommittee rejected “Scheme 6″ out of hand and have asked for a 6 month reprieve before the bulldozers show up. Since the taxpayers in Greensboro have rejected spending any money on the place during 2 previous bond referendums, we are going push for some sort of private/public funding to do what needs to be done to preserve the place in as close to its current form as possible. If we fail, the pictures you see here closely resemble what we will get. This entry was posted in Greensboro Politics, Life in General, War Memorial Stadium. Bookmark the permalink. Both comments and trackbacks are currently closed. Thanks for the update, David. Sad in a way. Not unexpected, promises and all, unfortunately. Still, better than the wrecking ball, I suppose. Question: It looks as if the promenade in front stretches all the way across Yanceville St. Am I seeing that right? “Better than the wrecking ball.” ?!?!?!? No we didn’t… we gave up. Pitiful and shameful. Sorry, David. Just trying to be conciliatory. I don’t quite have the investment you do in it. Once the debate of whether to build a new stadium was settled, my perspective on WMS was that it needed to be preserved as the memorial to WWI veterans it is with the hope that it could find some meaningful repurpose. To be clear, preserves as a memorial, not necessarily as a baseball stadium — but I take it you think it should have been preserved as a baseball stadium, not taken down to a ball field, essentially. I actually kinda like the renderings. The grassy areas will be a lot more kid-friendly than the current seating arrangement. Wasn’t the original memorial also supposed to be something that the veterans themselves could actually enjoy? I think about that every time I play there as there will almost always be at least one veteran somewhere on one of the teams. I think the goals of what this stadium will be need to kept in mind. It should be a memorial to not just the casualties of ‘the’ world war but to all our veterans, and also be a highly functional space that is enjoyed by the community, veterans included. What is the current timeline for the changes? DH – I’m with you. That’s an awful picture. So saving a wall is “preservation” of a stadium? David, is the P&R commission supposed to approve this on Wednesday? What happens now that the committee doesn’t like this idea? Don’t know, Amanda. My guess is that their agenda is already set. At this point the fear seems to be that if the $1.3M isn’t spent on WMS soon, other pressing City matters might be inclined to usurp the funding. Kind of “use it or lose it”. If I had a vote, it would be to lose it if this is to be the result of how we “save” War Memorial. Jim, you have just proven that there is no accounting for taste. Other plans (Schemes 1 – 5) all had ample room for children to romp – especially where the stadium section down third base is to be demolished without much objection from anyone. A grassy berm was planned for that area. But it still left something that at least resembled a stadium. Update: It is on the P&R’s agenda to hear the current plan you speak of. But they aren’t expected to give a recommendation on it, maybe until next month. Since I only saw these pictures, I couldn’t compare to schemes 1-5. What do you think of my point – what’s needed is a (1) Memorial, and (2) functioning field that is fully utilized? When were these changes planned for? There were some rough sections of ‘stadium’ when I was there last. This is primarily a baseball park and I would hope that any construction timeline would start in the late fall and be ready for the field to be used again by the next spring. I think more is needed. I will post, at least, Scheme 5 in the next day or so. Even that scheme demolishes most of the old structure. But it is much more palatable in what is rebuilt in that it recreates part of the original stadium. More like a multi-use stadium/farmer’s market/amphitheater, though. With plenty of open space. Matt Brown’s efforts to build an amphitheater at the Coliseum were justified by saying it could rake in $150k in profit the first year. And I believe him. Why not transform WMS into that new performance venue that also has the ability to host baseball games and capture that income? Sorry for my snarkiness earlier, Jim. I’m kinda pissed. This is your house. If I don’t like the snark, I’ll refrain from coming back. I know it is a sensitive issue. My baseball league plays 2-4 games/week there for a good chunk of the summer…at least we used to. I checked our current schedule, albeit only till mid july, and we only have 3 games scheduled. The guys in my league love playing there and it is the best field we use. My point of reference is the DAP in Durham – the stadium from the movie Bull Durham. Lots of great ballplayers came through there too. I played a game there probably 5 years ago and it was a dump. I don’t know what’s come of it since then, but that was where I never wanted WMS to go. The consistent use WMS gets helps to ensure that at least the field gets attention. Another thing I like about the rendering is that there seems to be a lot more cohesion with the neighborhood. You can look in from outside and see the field. I look forward to the other renderings, and will there be cost projections listed for the others too? Not that my opinion as a resident of W-S is worth much practically speaking. I think what’s left of the stadium will continue to fulfill its original purpose, but it is a much diminshed thing, reflecting our much diminished appreciation for the sacrifices of the veterans of that little remembered or understood war. I’m reminded of Robert Frost’s poem, The Oven Bird. Do you think concrete stands with fixed seats that will be used once or twice a year is really a more meaningful memorial than could be achieved with the seats shown above and the grassy areas? What would be really nice would be more information about veterans of all generations. Info about Greensboro residents in WWI, WWII, Korea, Vietnam, Gulf War, Afghanistan, Iraq. 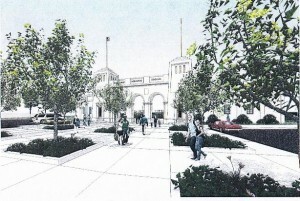 That could cost much less than building fixed seating & other things and also stick more to the War Memorial mission. I would question how useful the stadium, in its current form, is as a Memorial, and that is something that could be improved. The old Durham Bulls Athletic park underwent a $5,000,000 renovation that was completed in December 2009. …more photos from Durhams old park. By the way, I’m hoping War Memorial can experience a similar rejuvenation. OK, words eaten with the changed situation. It looks like a whole new park – not one to rival the new Bulls park, but a very nice place to play. Where did the $5M come from? Looked like there were lots of private sponsors. Anyone ping AG for some dough? The idea of A&T contributing also sounds good, but budgets have to be tight there, as everywhere in education. One of my points was that the playing field at the DAP stunk. Looking at a Duke hitter, the batters box & infield grass look great. OK Hogg. The pics of DAP have forced me to rescind my approval of scenario 6. If they can fix up DAP, GSO should be able to fix up WMS. If you need to wait, wait, but it should be done. DB1969, thanks a ton for the great pictures of a great remodel job!!! Thanks from me as well, DB. And thanks for relenting, Jim. Durham gets it, Greensboro… not so much. I truly believe that much of what has driven WMS plans into the ground is its renovated potential to harm the full utilization of the new ballpark. When the new place was being pitched by Action Greensboro, et al, they touted the future of WMS as being THE place for amateur baseball in the future and that New Bridge was to be for professional ball. Guess who’s playing at New Bridge tonight? Page HS vs Grimsley HS. Follow the money… as they say. 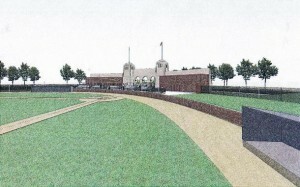 Durham has their own new ballpark, so the issues should be similar. I would imagine that Page v. Grimsley is at NB because that is where the schools chose to play, and you won’t be able to do much to WMS to sway that decision. It does appear that a good chunk of the old DAP stands were removed, even prior to this phase of renovation. WMS needs to get smaller, seating wise, it’s a question of how much smaller.